I'm recommitting myself to this blog and the notion of sharing my crazed addiction for all things "vintage" with like minded souls. Surely while I was away from this forum I have not lost my thirst and drive to pick through dumpsters, rummage through garage sales or rifle through thrift stores. In fact this past week has provided me some goodies I would love to share with you. I found this awesome wing chair at a thrift store. I got a GREAT deal on it! It was too good a deal to leave behind. Now where should this go? That part I haven't figured out just yet. I love the cottage, home spun inspiration of the embroidered fabric. The colors would work well in my sun room but there really isn't any room for it! UPDATE: I learned something new! This fabric is considered Crewel Embroidery which Wikipedia defines as: A decorative form of surface embroidery using wool and a variety of different embroidery stitches to follow a design outline applied to the fabric. The technique is at least a thousand years old. Until such time as it's home has been found. It's relegated to storage for now. I found these jars in a few different locations but they come together very nicely! I think they look very fresh and clean. I'm still a big fan of milk glass. 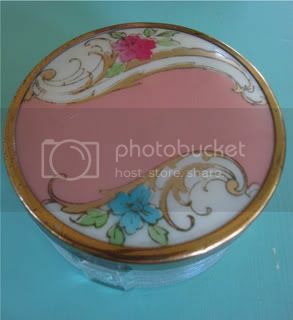 A sweet enameled vanity jar. 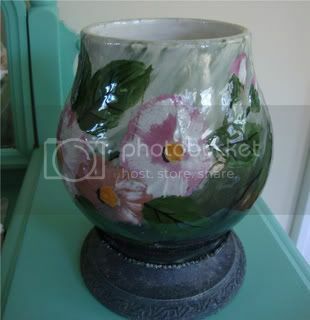 Great painted planter whose metal base weighs a ton. 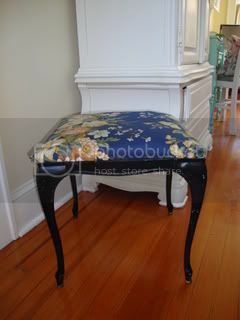 I was sitting at my banquette reading a book the other day when I thought to myself, "Wouldn't an ottoman or stool be good to put my feet on?" Low and behold, I came across this little gem. It's a wrought iron bench I found at a thrift store. 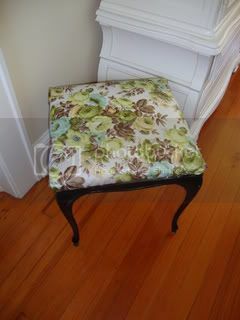 I am going to reupholster the cushion and paint the base. I purchased this fabric at an estate sale quite some time ago. I have loved this vintage Waverly pattern called "Millerton". I think I will use it on the bench.... it finally found it's home! What color should I paint the base? I'm toying with the soft cream yellow or the aqua. My dilemma with the aqua is it likely won't work with the banquette near by. What do you suggest? YES! Great finds! Every single one of them! I also love milk glass!